I positively love Murder, She Wrote, the TV series. Naturally, I have to read the books, yet I've been slow in doing so. Gin and Daggers is the first in the series and I just started reading it. My new goal is to read one of her books for each month. There's plenty, so it'll take me a while. I keep writing "she" when it should be "he." The books are "written" by Jessica Fletcher, but it's really Donald Bain. I know discussions are abound about gender-bending in writing and I do my best not to let the author's gender influence me on the writing. I don't think Bain does a bad job of writing from the female's perspective. I sure hope he watched the show quite a bit. He does seem to have the secondary characters down, but I've just started and I want to read a mystery set in Cabot Cove to get a better feel. I guess it'll take some getting used to. When watching the series, the story/mystery takes place from different points of view, but the book's written from first person (Jessica). It's just a little odd. Kind of like having to remember the furniture in the living room has been rearranged. There might be a lot of knee-banging on the coffee table, but eventually one gets the hang of the new layout. In this story, Jessica takes a trip to Merry Old England for an international mystery writers symposium. While there, she decides to look up and old friend, colleague, and mentor, Marjorie Ainsworth. During the visit and the dinner party, poor old Ms. Ainsworth is murdered and Jessica's the prime suspect. But everyone at the dinner party is Jessica's suspect and they had a lot of motive. As Jessica digs deep into the mystery, she uncovers some things about her dear old friend, including the question of authorship of Ainsworth's latest book, Gin and Daggers. As I mentioned earlier, I'm still feeling myself around this book. The writing is different from the series and this one had too many characters, I felt. 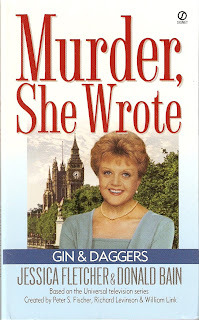 There are plenty of books to get the hang of this and I do love Murder, She Wrote so I might stick this one out. I also enjoyed episodes of Murder, She Wrote, the TV series. I'm curious to read your reviews on the other books in these series. its one of my favorite thanks for sharing this with us.